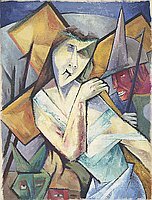 Abstracted male figure in hues of yellow, blue, green, red, gray faces the viewer. Dressed in green top and blue bottom, he leans to the left as he carries a large yellow and orange hued cross on his back; one eye is closed, the other is orange; green thorns encircle his brow. To the right, profile of a red-faced figure with bared white teeth wearing a spiked helmet and holding a spear. Two faces appear in lower left; left, green with pointed ears; right, red with yellow headgear; both have one eye closed. At top, curved gray horizon against blue background.